Update (October 16, 2018): The County Council decided to retain this trail segment in the Bicycle Master Plan! Thank you, trail supporters who wrote to the Council! 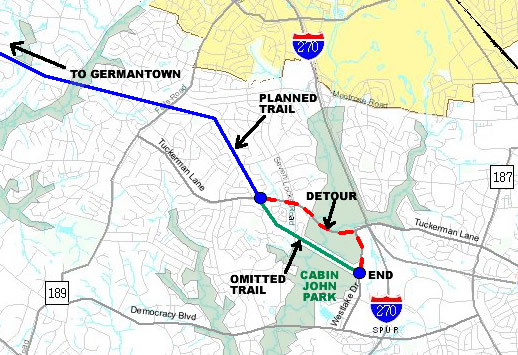 The 13-mile long PEPCO paved trail was conceived to run from the South Germantown Recreational Park in Germantown to Cabin John Park in Bethesda. These two parks are superb destinations, each with its own trail network, parking, and amenities. The paved trail will be accompanied by a parallel natural surface trail, some of which has already been built. But the 2018 draft of the county Bicycle Master Plan omits the last mile of the paved trail, between Tuckerman Lane and Westlake Drive, thus eliminating the connection to Cabin John Park. Trail users would have to use a future detour sidepath along Tuckerman Lane and Westlake Drive instead, crossing two busy intersections and several driveways in the process. That’s unsuitable for this type of trail. Please write to the County Council by October 15th to support the full trail (see below). The map below highlights the issue. The bicycle plan would omit the green segment, putting trail users onto the detour sidepath shown in red. The detour sidepath along Tuckerman Lane would pass through two busy signalized intersections: Tuckerman/Seven Locks Rd and Tuckerman/Cabin John Mall Entrance (usually much busier than what Google depicts). The detour path would also have to cross several residential driveways and at least one side street. The PEPCO trail is meant to be a safe, comfortable hiker-biker trail with few crossings. 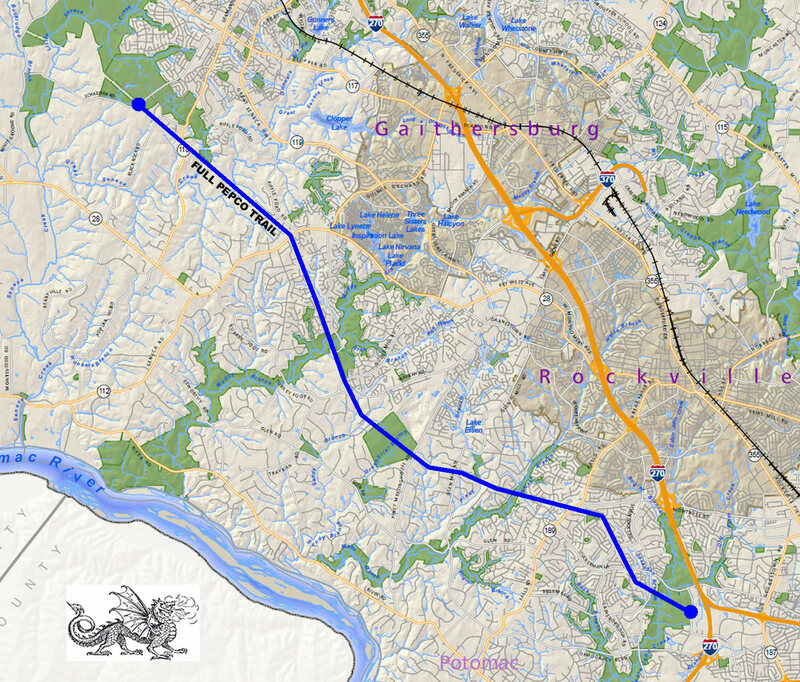 Advocates pushed for the paved trail for 20 years and never gave up, but the county wants to give up on the last mile after just a few months’ analysis, based on PEPCO rules among other things. Rules can change. Omitting the last segment from the plan would likely mean it never gets built or even studied. County planners are justifiably concerned about steep terrain, but there are potential solutions that can and should be explored. The County Council is currently deliberating on the draft Bicycle Master Plan and may decide on this issue very soon. Please write to the County Council by October 15th, 2018 at council@montgomerycountymd.gov. Ask the Council to include in the plan the omitted paved trail segment from Tuckerman Lane to Westlake Drive. Explain the need for a quality link to Cabin John Park, not just a sidepath detour. See the Council webpage if you need additional Council info. If you have questions, you can contact me, Jack Cochrane, chair of Montgomery Bicycle Advocates (MoBike), at email@mobike.org.